Editor’s note: This post was originally published on BIMSCAPE's blog and re-published here with permission. Let’s say (for example) that we want to move Wall (1) over to the left, so that it’s face aligns with the left hand face of wall (2). 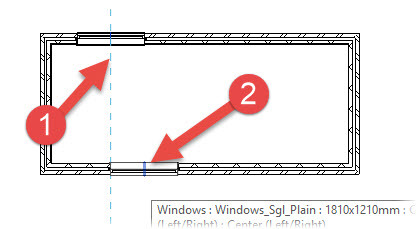 I will point out at this stage that the “Align” tool works with all sorts of Revit elements, not just walls.So let’s go ahead and use the “Align” tool to shift the wall over. The “Align” tool is what I call a “2 click operation” which means that there are just 2 clicks from selecting the tool; to completing the operation. Please note that the order of the clicks is very important. The second click should be on the element you wish to “align”- i.e. the one that will actually move. As soon as you’ve made your second selection, Revit moves the right hand wall over to the left and aligns the faces as per your instruction. It also immediately displays a small padlock icon between the 2 elements. This represents a potential “Constraint”. Notice how the padlock icon is shown “open”. This tells you the constraint has not been activated. If you’d like to constrain the alignment of the 2 wall faces- i.e. ALWAYS keep them aligned- simply click on the padlock icon to form a constraint. We simply the use the “Align” tool as we did in the first example- that is, click on the wall face you wish to align “to” (1, in this case) and then select the wall face you wish to align (2, in the above image). Revit will rotate wall (2) as it aligns it with wall (1). I have selected a face on the second wall from the left as the plane I wish to align “to”. With “Multiple Alignment” checked on the Options Bar, I can now simply click on a face on ALL the remaining wall instances and have them align to the dashed blue line. Also on the Options Bar is the facility to state your preference with regards what Revit will detect when selecting faces / planes- You can choose Wall Centrelines, Wall Faces, Centre of Core or Faces of Core. 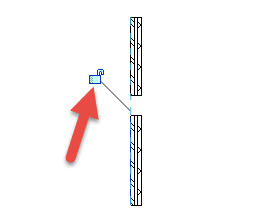 Constrain the alignment by clicking on the padlock, if you wish Revit to ALWAYS maintain the alignment.